← I have a running partner! Real chicken as the first ingredient blended with other high-quality protein sources helps support strong muscles and a healthy heart. Omega-6 helps give your dog a radiant coat and healthy skin. Natural sources of glucosamine help support healthy joints. Highly digestible so more nutrition goes to work inside your dog. I know I can order just about anything online, but it never occurred to me that dog food was one of those things. I ordered Sandy the bag of Purina ONE, and five days later it was here. With Amazon Prime, it would have been here even quicker, in two days’ time. I didn’t have to worry about going to the store and lugging the bag of dog food from the store shelf to the shopping cart, from the shopping cart to my car, from my car into the house. Thanks to the power of the internet, it magically appeared at our doorstep. Day 1+: Taste: When your dog loves the taste of his food, it can make all the difference. Day 7+: Energy: An optimal blend of ingredients provides the energy your dog needs. Day 14+: Digestibility: Highly digestible food helps more nutrients go to work inside your dog. Day 21+: Skin & Coat: Balanced nutrition supports a beautiful coat and healthy skin. Day 21+: Bright Eyes: Your dog’s eyes are a window to his health. Day 28+: Dental Healthy: Great nutrition and crunchy kibble support strong teeth and healthy gums. Sandy has been eating the Purina ONE Chicken and Rice formula for a little bit over a week now. So far we have seen that she really likes the food, she finishes her bowl within minutes, and looks at us as if asking for more. We have also started to notice she’s a bit more energetic than usual. If we’re on the couch watching TV and winding down for the night, she jumps on our laps and wants to play. 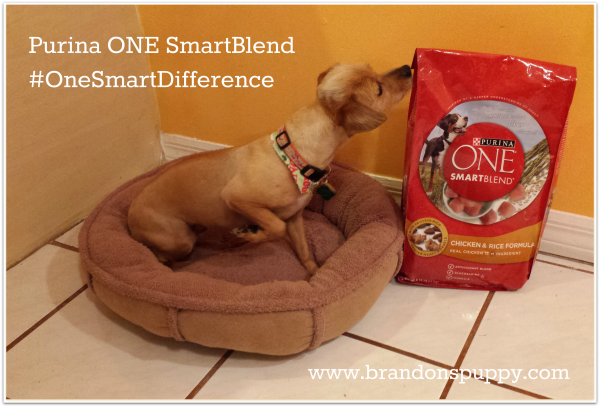 I encourage you to try Purina ONE SmartBlend. What difference will you see in your pet? This entry was posted in Doggy Dearest, Health & Wellness. Bookmark the permalink.